Printed by W.H. Willis & Co., London, 1886. After the Conservatives lost the 1880 election and Disraeli's death the year after, Salisbury (King of Diamonds) emerged as Conservative leader in the House of Lords, with Sir Stafford Northcote leading the party in the Commons. He became Prime Minister in June 1885 when the Liberal leader William Ewart Gladstone resigned, and he held the office until January 1886. 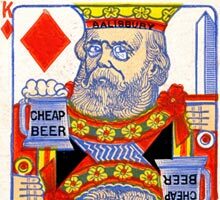 When Gladstone (Grand Old Man, King of Hearts) came out in favour of Home Rule for Ireland, Salisbury opposed him and formed an alliance with the breakaway Liberal Unionists and the won the subsequent general election. He remained Prime Minister until Gladstone's Liberals formed a government with the support of the Irish Nationalist Party, despite the Unionists gaining the largest number of votes and seats in the 1892 general election. 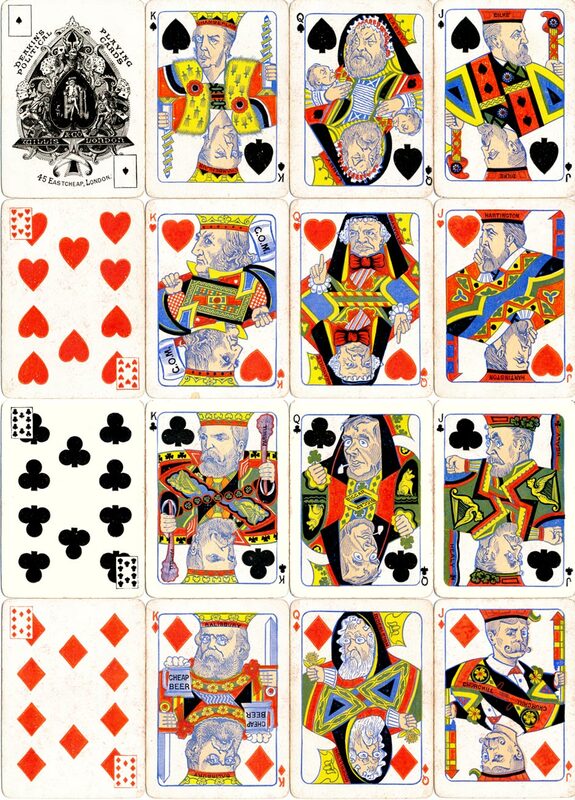 Above: cards from the 1st edition of Deakin's Political Playing Cards, printed by W.H. Willis & Co., London, 1886. The packs were printed in three editions by Willis and Co., and the first edition sold 60,000 packs in three months. The slogan Home Rule for Ireland was popularised by Isaac Bath and Parnell (King of Clubs), leaders of the Movement. Other political personages can be seen depicted in the remaining court cards. Images courtesy Barney Townshend.